Sheri Fink is the #1 best-selling author of the award-winning children’s books, The Little Rose, The Little Gnome, The Little Firefly, The Little Seahorse, Exploring the Garden with the Little Rose, and Counting Sea Life with the Little Seahorse. She and her husband, author Derek Taylor Kent, created the Whimsical World brand to inspire and delight kids of all ages while planting seeds of self-esteem and high achievement. Sheri and Derek live a whimsical life in Southern California with their dog, Zander. Discover more at SheriFink.com. Sheri Fink has created a story that young children will love, and parents will love reading it as well. 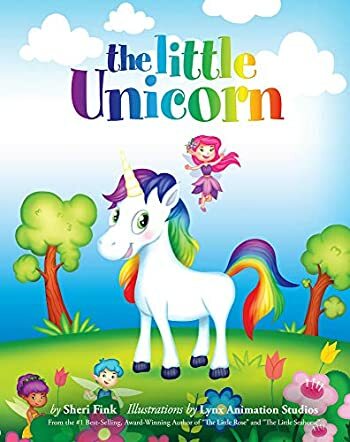 This would be a fantastic bedtime story, leaving the young child with visions of unicorns, rainbows, flowers and all things lovely as they drift off into sleep. And while I'm on the subject of "visions", I must comment on the beautiful, colorful illustrations in this book. Lynx Animation Studios definitely deserves a note of appreciation from this reader. These lovely pictures will certainly make my granddaughter smile. This beautifully written book even made me smile.